'It is crucial that they should remain secret to protect India's defence preparedness,' explains Claude Arpi. The Election Season is on. On Friday evening, the Modi Sarkar comfortably sailed through its first confidence motion after a 12-hour debate. The motion moved by the Telugu Desam Party ended with the BJP winning with a margin of 325 vs 126 against the Opposition. It was not without drama. Congress President Rahul Gandhi delivered a fiery speech ending with a great theatrical move. As a national newspaper noted, the debate was 'advertised almost like a prize bout, with Gandhi the challenger and Modi the comfortably ahead reigning champion'. Not less 'dramatic' was the accusation of the scion of the Gandhi dynasty that there was something fishy in the Rafale deal with France. Rahul Gandhi claimed that though the government said there was a secrecy clause covering the details of the deal, it was not true. Probably as a first, the spokesperson of France's ministry of Europe and foreign affairs immediately issued a clarification about the Congress president' statement. The French ministry usually never comments on internal issues discussed in the Indian Parliament. The rebuttal came after a question asked if the Indian defence minister had been lying when she mentioned the secrecy clause. Defence Minister Nirmala Sitharaman later reiterated that the secrecy agreement of 2008 covered the Rafale deal. It was followed by a privilege notice submitted against the Congress leader; he was accused of misleading Parliament during the no-confidence motion. On September 23, 2016, then French defence minister Jean Yves Le Drian, accompanied by Eric Trappier, chairman, Dassault Aviation signed with India a 7.87 billion Euro deal (about Rs 59,000 crores/Rs 590 billion) for 36 Rafale fighter jets. The basic cost, armaments, offsets and service value had been finalised a few days earlier; it was included in a several-thousand pages IGA. It is this document which is secret. Because it describes in details the configuration of the fighter planes and their armament as well as other clauses of the contract such as maintenance of the Rafales or the training of the pilots. The fact that it took nearly a year-and-a-half to negotiate these details shows the complexity of the deal. On April 9, 2015, when an Indian delegation visited Paris ahead of the prime minister's arrival, the French side was then informed of Delhi's decision to purchase 36 planes 'off-the-shelf'. It was not really 'off-the shelf' as the aircraft had to be tailored to the needs of the Indian Air Force which has the responsibility of defending two fronts at the same time (the Chinese front being rather complex with the altitude of the Himalayas, the length of the front and the often better equipped People's Liberation Army). India placed the order, primarily due to the IAF's 'critical operational necessity'. The complexity of the IAF's requirements delayed the process for months. It is these requirements which cannot be made public. Can you image Indian politicians (or 'experts') starting to publicly discuss the pros and the cons of such military equipment? It would certainly provide India's enemies with indications about the IAF's tactical plans, in case of a conflict. In fact, it is rather surprising that Indian politicians ask for 'details' of the deal. It is crucial that they should remain secret to protect India's defence preparedness. The process had been a long one and the IAF suffered. It took 15 years to arrive at the 2016 signature. India is probably the only country in the world which has such a cumbersome system for defence procurement. Is it better under the present government? I am not sure. While the Congress president compared the Indian Rafale deal with the purchase of 36 Rafales by Egypt, he forgets to mention that in the Egyptian case, it was literarily planes 'off-the-shelf'. The deal was sealed in a few weeks. Egypt did not have the immediate tactical need for the aircraft; Cairo was more interested in the immediate delivery of a few planes (originally destined for the French air force), to show its neighbours that it had the Rafales. Incidentally, there are different versions of the Rafale. On March 20, 2017, Le Drian, authorised the launch of the development of the new Rafale F4 standard. Dassault Aviation and the 500 French companies associated with the programme were delighted to have again the French government's trust and support. 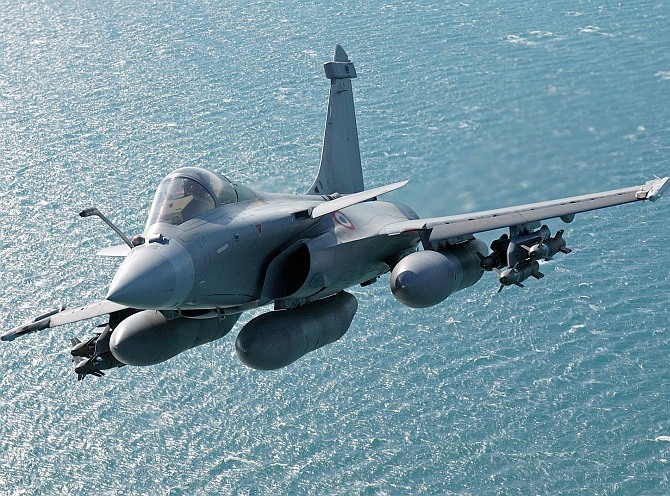 In a statement, Dassault asserted that the Rafale programme was based on continuous developments to adapt the plane, through successive standards, to changing needs. From 2023, a first version of the F4 standard will follow the F3 R standard available in 2018. It is indeed difficult to compare the price of one Rafale to another Rafale (even if one walks in a Mercedes showroom, you will be told that there are different models and even within the same model the price can greatly vary). An initial Request for Information for 126 Medium Multi-Role Combat Aircraft (MMRCA) was issued in 2001; the Request for Proposal was only publicised in 2007 and then the 'complications' started. In January 2012, after a long competitive process, in which the American F/A-18 and F-16, Russian MiG 35, European Eurofighter and Swedish Saab Gripen participated, Dassault and its partners Thales and Safran were selected to supply 126 planes to the IAF. Of the 126, 18 planes were to be manufactured by Dassault in France, while the remaining 108 planes were to be built in India, under a large Transfer of Technology agreement, by Hindustan Aeronautical Ltd. It soon became clear for Paris and Delhi that an immediate transfer of technology was far too ambitious. Further, Dassault was not ready to take 'full responsibility' for the 108 fighters to be manufactured in India by HAL. The negotiations had reached an impasse when Prime Minister Narendra Damodardas Modi decided to go for 36 planes as a stop-gap solution. During his visit to India in March, President Macron discussed an important part of the project: The offsets. This will be a major part of the deal (never mentioned by politicians). At the end of 2017, Florence Parly, the French defence minister, visited India to 'strengthen defence cooperation and offering a production line in India for the Rafale jets'. Ms Parly and her Indian counterpart Nirmala Sitharaman travelled to Nagpur to launch a joint production facility between Dassault Aviation and Reliance to fulfill part of the Rafale deal's offset obligation. Around Rs 20,000 crores (Rs 200 billion) needs to be invested by the French. The Dassault-Reliance joint venture has already shortlisted a large number of vendors, mostly small and medium-sized enterprises, to be part of an indigenous supply chain for the Rafales. The strengthening of Indo-French relations will greatly depend on the success of this JV. In the meantime last week, the IAF has received responses to its 'Request for Information' from six fighter aircraft manufacturers for the purchase of 110 new fighter planes. The same companies -- Boeing and Lockheed Martin, the Russian Aircraft Corporation, Dassault, the Swedish firm Saab and the European consortium, Eurofighter GmbH -- expressed their interest to supply the desired aircraft. The IAF had issued a detailed 73-page RFI on April 6, giving 'original equipment manufacturers' (OEMs) and 'government-sponsored export agencies' a three-month window to submit their proposals. Let us hope that this time, it will not take 15 years and that it will generate less unnecessary political heat. Claude Arpi holds the Field Marshal K M Cariappa Chair of Excellence at the United Service Institution of India. Ali Zafar puts no-kiss clause before signing films!